The Longwood Suite offers an exquisite king size bed, dresser, closet, bench seat, its own AC unit and heater, and ceiling fan. Other amenities include wireless, high-speed internet access and a High Definition Television with cable channels. AM/FM/CD Clock Radio and DVD Player available upon request. The private en-suite bathroom includes a full size tub/shower combination, heater, exhaust fan, and a unique oval-shaped port window. Upgrade to second bedroom with queen size bed, perfect for a friend or family member who may need the privacy; it is also perfect for a third person or a second couple. 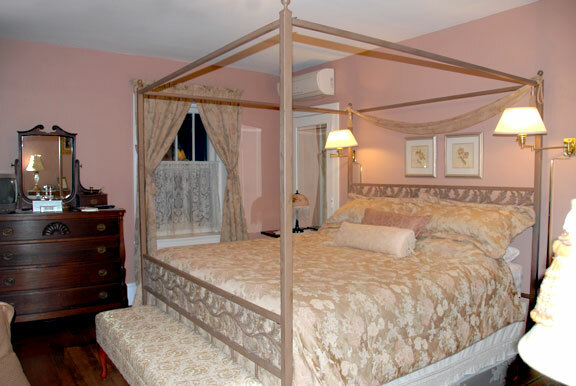 This optional bedroom is furnished with a night stand, closet, and two cushioned, wrought iron chairs and table. Other amenities include the room's own AC unit and heater, ceiling fan, and wireless, high-speed internet access. AM/FM/CD Clock Radio available upon request. The private en-suite bathroom is centrally located between the main bedroom and the second bedroom. A local Chester County muralist, Dan Gotel, painted the Longwood Suite's sitting room. Mr. Gotel prides himself in pulling the audience into the feel of the scene. "Staying here was wonderful! The bed was very comfortable and the Victorian details were very welcoming. The hospitality was the best I've encountered! 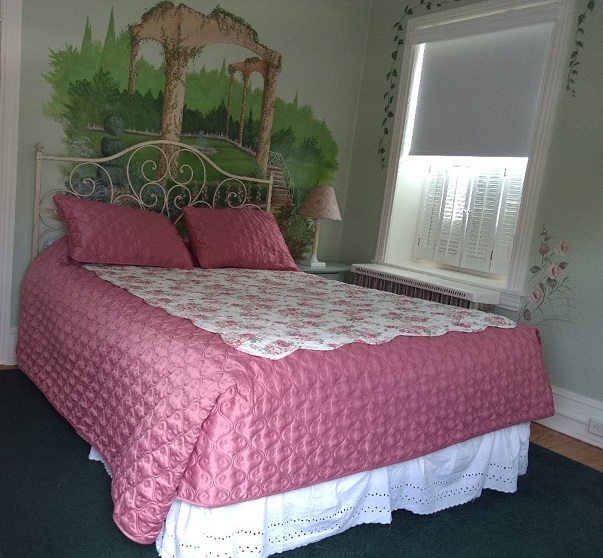 We will highly recommend this B&B." "The bed was super comfy - we think we need a king now! And the room is beautiful - excellent taste. We felt cozy and happy and thoroughly enjoyed the breakfast! Thanks for being so friendly and helpful. Would definitely recommend your B&B!"